Need a breath of fresh air? Who doesn’t? If you’re in Elora, Ontario (north of Guelph) with the dog, there are a number of walking trails through the fall foliage of dog-friendly Elora Grand River Conservation Area , the first park of its kind established in 1954. 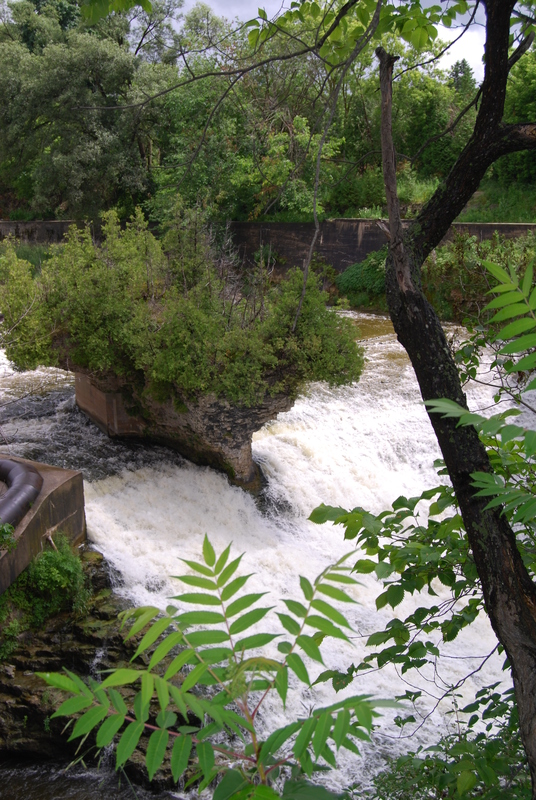 I’ve taken dogs along short trails, one starting not far from Elora’s quaint downtown of specialty shops, antique stores and Ashanti coffee cafe. This trail is a reasonable easy descend down to the river’s edge, then it meanders along the edge of limestone cliffs and caves. It’s a good way to kill an hour or two. But for the full day experience, drive to the conservation site entrance and pay the minimal admission fee ($3 for kids and $5.75 for adults). Then the park is your playground. This is where I’ve picnicked, barbequed, and thrown Frisbees many times in the summer. 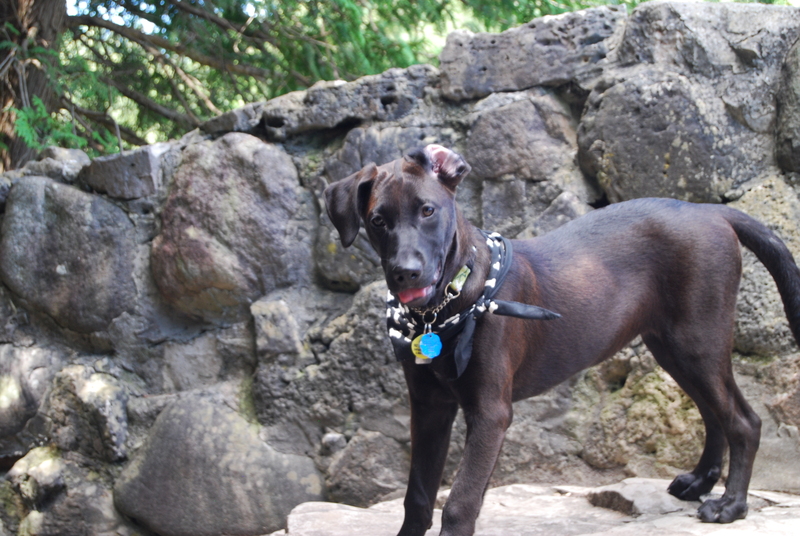 Anyone with a sense of adventure, including dogs, can walk the trails along the edge of the gorge. Use the metal stairs leading to the banks of the river, then circle back to the picnic areas where open fields allow for great dog runs (although you’re supposed to keep them leashed); public water faucets fill dog bowls easily; and private corners keep canine-focused picnics out of view. The park offers both day passes and overnight campsites (145 serviced with water and electricity) ranging from $35 to $40 a night for up to six people. It’s very family friendly, has a ban on alcohol, and permits dogs. The swimming area however, originally dammed more than 50 years ago, is no longer because it’s being allowed to renaturalize according to current day environmental standards. If you’re a thrill-seeking water hound (and have someone to hold Fido), you can ride an inflatable inner tube (in the summer) down the river rapids (when the water is high and fast enough). It’s a rough ride, not recommended for young kids (or obviously dogs), and you have to wear a helmet, lifejacket and a wristband indicating you paid your fees at the concession stand ($25 for all equipment). Water shoes are recommended, and don’t wear sunglasses because you’ll lose them. Guaranteed. 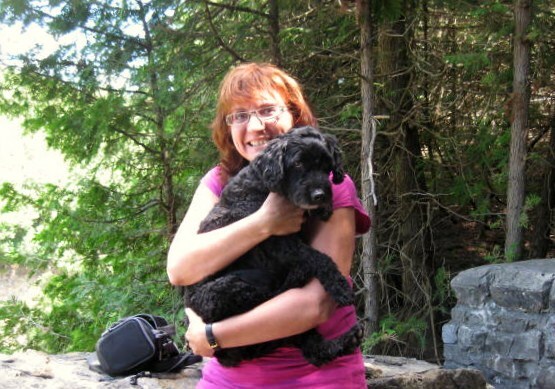 For me, the Elora Gorge will always be about picnicking and hiking – walking actually – with dogs. From May to October, it’s an easy scenic three-kilometre walk along clearly groomed paths, and stairs with railings that overlook a 22-metre drop in places with a clear view of waterfalls. Bring a camera. TRAVEL GUIDE: Don’t want to camp? Stay near downtown (and a trail entrance nearby) and check into the Jagara Vacation Rental B&B. Few Bed and Breakfasts in this area are pet-friendly, but Jagara (23 Church Street, 519-291-8641) proudly is. Enjoy the full two-bed room apartment in the back of the house, with kitchen, sitting area, back deck, barbeque and fenced yard. Fire up the grill and the dog dines with you. Read about other dog-friendly outdoor adventures nearby in Hamilton here. Also, Port Burwell has a doggie beach. Check it out. If you’d love a guide to dog-friendly campsites check out Dogfriendly.com’s guide to campsites and RV parks. It’s a little out of date but still valid. If you’re curious, check out this camping tent just for dogs … I’m tempted, I’ll admit. I went to Elora for a wedding, and was surprised by how beautiful the landscape was and how nice the trails were. They’d be ideal for a dog. Sasha and Victor look like they had a great time. If I were in your area, I’d definitely check this out. Love the water fall. The water, and waterfalls, is the highlight of the area. Sasha is young in these pics, although I’ve been out with both dogs a few times. Now, because Sasha is a lab, she heads straight for any body of water.